This week, I’m knitting with Rozetti Yarns Alaska, a light and airy yarn that wraps one in warmth and softness. Today I’m making a hat to match the Choux Cowl. I was so impressed with the plaid patterning of the cowl I made yesterday, that I want to make a hat to go with it, but with the colors reversed. Join me today as I reverse the colors for the toque that matches the Choux Cowl! The effect is awesome! And again, Rozetti Yarn Alaska is so light yet warm. finished measurements approximately 19” circumference, 10” height, to fit size medium head. 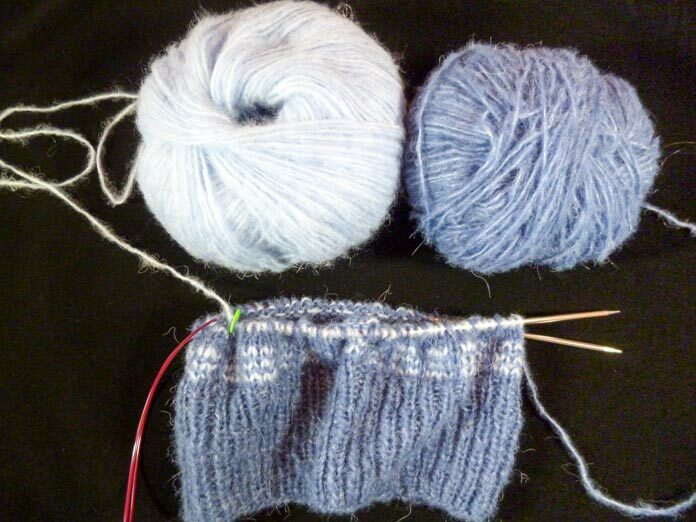 The rib is very stretchy, so if you knit loosely, you may need to use a smaller sized needle for the rib section. Using MC and US5 [3.75mm] needles, cast on 90 stitches, and join in the round, being careful not to twist the stitches. Place a stitch marker to mark the beginning of the round. Knit a 1×1 rib (K1, P1) for 3”. On the last round, increase evenly by 6 stitches (96 stitches). Odd Rounds 1-7: With MC, knit to end. Even Rounds 2-6: With CC, * k3, sl 1 purlwise wyib; rep from * to end. Round 8: With MC, knit to end. Repeat Rounds 1-8 for pattern for a total of 4 pattern sets. Your work should measure approximately 7” from the cast on edge. Round 2: With CC, * k3, sl 1 purlwise wyib, k2, sl 1 purlwise wyib; rep from * to end. Round 3: With MC, knit to end. Round 4: Same as Round 2. Round 6: With CC, * k3, sl 1 purlwise wyib, k1, sl 1 purlwise wyib; rep from * to end. Rounds 7 & 8: With MC, knit to end. Round 10: With CC, * k3, sl 2 purlwise wyib; rep from * to end. Round 11: With MC, knit to end. Round 12: Same as Round 10. Round 14: With CC, * k3, sl 1 purlwise wyib; rep from * to end. Round 15 & 16: With MC, knit to end. Round 18: With CC, * k2, sl 1 purlwise wyib; rep from * to end. Round 19: With MC, knit to end. Round 20: Same as Round 18. Round 22: With CC, * k1, sl 1 purlwise wyib; rep from * to end. Round 23: With MC, knit to end. Round 24: With MC, k2tog to end, cut yarn and gather up remaining 12 stitches with a tapestry needle and weave in ends. The hat is designed to be worn with the ribbed band turned up to provide a doubled fabric over the ears. This way, it will be warm and soft to wear on a cold winter’s day. I’m very happy with the finished product. Now I’m looking forward to making a lightweight cowl to be worn with my new hat. 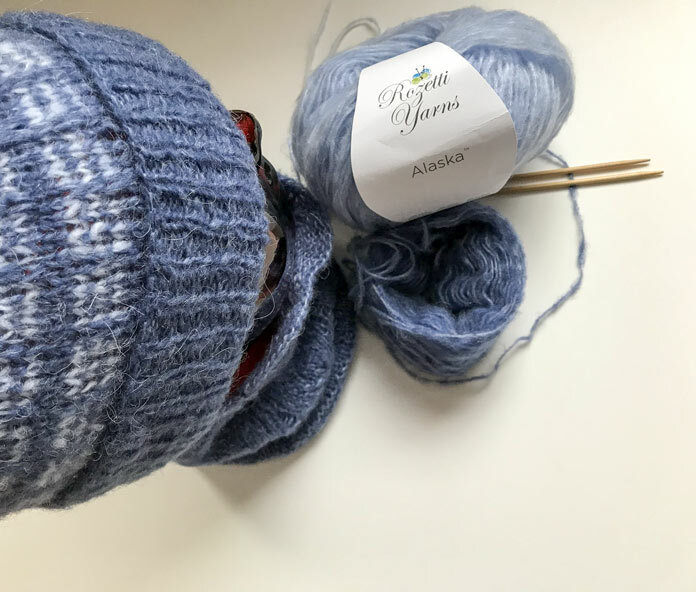 Join me tomorrow as I use Alaska to knit a lacy cowl to complete my ensemble. Cindy O'Malley has been knitting since age 5, and is a test knitter for a yarn company. 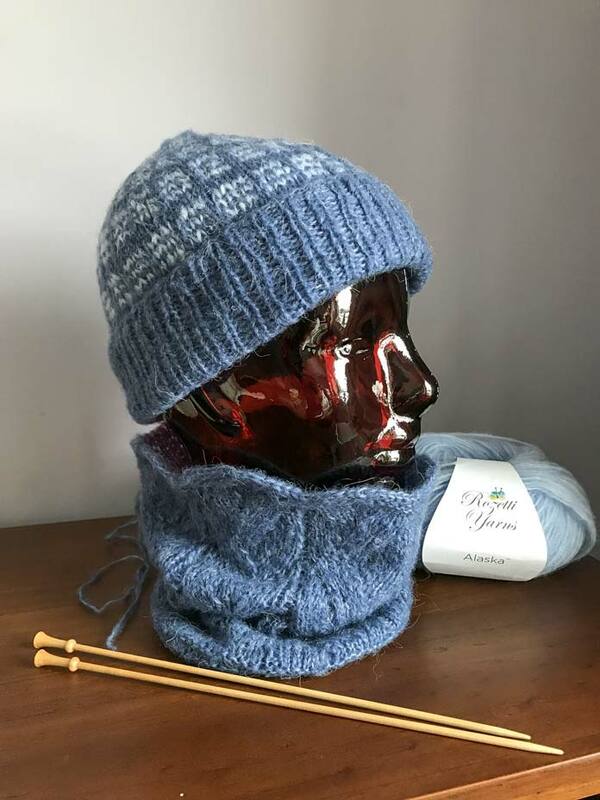 Actively involved with knitting organizations and events such as the Toronto Knitters Guild, TTC Knitalong, and Toronto Knitters Frolic, she also authors the blogsite CindooKnits, and now writes for KNITmuch.